EASTLAKE - Rosella (Rosie) Shepard, of Eastlake, wanted to celebrate her 100th birthday with a sky-high helicopter ride over Cleveland. Thanks to her two daughters, Rosella Kazmir and Jean Norris, Shepard and an entourage of friends and relatives headed to Burke Lakefront Airport Aug. 16 for a wish come true. Shepard had flown on a passenger airplane once in her lifetime, but said no way to a ship, except for the Goodtime and the old Aquarama. She can’t swim, she said. For a long time, she made it clear that the helicopter was her choice for the big day. Amiable pilot Cory Tosi, of Paratus Air, greeted everyone then led the group out to a Robinson 44 4-door helicopter waiting on the tarmac. Tosi, a former infantry paratrooper with the Army’s 82nd airborne, jokingly said he didn’t land with a plane until after he took flight training following the Army duty. A grinning Rosie was helped into the co-pilot seat and belted in. Her daughters climbed aboard, and they were off circling over the city of Cleveland, up to 1,000 feet and down and back and forth. Fifteen or so minutes later, they were back on the tarmac, with Shepard grinning even more. Her mom excitedly pointed out the old May Company and reminisced about other familiar landmarks. “I want to take the pilot home,” said Shepard, as she got out of the helicopter. Shepard also had a red carpet party on her actual birthday on Aug. 18. She was delighted when Eastlake Mayor Dennis Morley presented her with a proclamation. When asked the secret of her longevity, she really didn’t have an answer. It was clear, as she talked, that in spite of some serious challenges in life, she reflects a positive attitude. In fact, her friends say they turn to Shepard for cheering up when things get difficult. “I have been blessed,” she said. Part of it is from a wonderful family growing up, she said. Although her father died when she was very young, her mother remarried a loving man. Her own marriage to Norwood Shepard and their four children continued her blessings. Genes help. Her mom lived until 92. She works magic with embroidering, especially crewel, as you can see in her apartment filled with embroidered artwork, from portraits of Jesus, boxes, lots of butterflies and more. Shepard sets her alarm every day to exercise at least the 123 steps to the elevator and back. She also has weights for arm exercises. Every Sunday, you will find Rosie at her church, the Church of Jesus Christ of Latter-day Saints, doing what she does best, greeting people and handing out bulletins. For her 101st birthday, she plans on going up in a hot air balloon. The next year, 102, it will be a zeppelin, as she calls it, or airship of some kind. Still no ship, though. Pilot Cody Tosi has Rosie Shepard and her daughters Jean Norris and Rosella Kazmir ready to go. 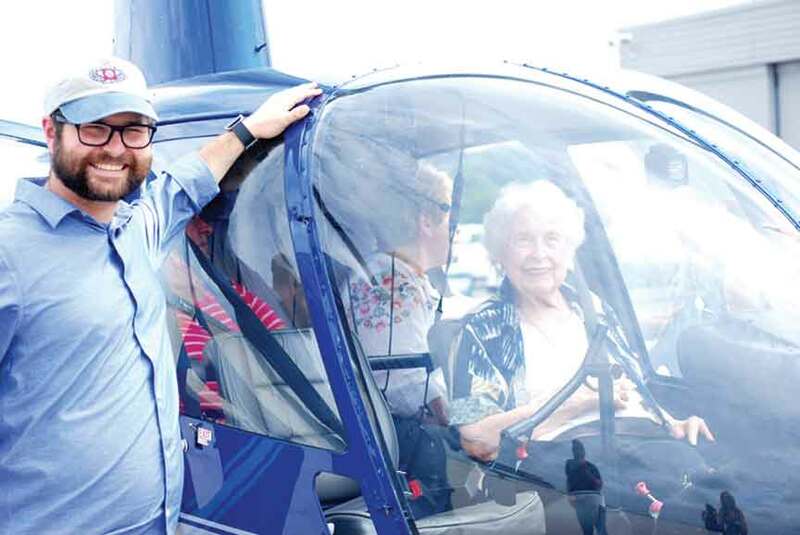 Rosella (Rosie) Shepard, of Eastlake, wanted to celebrate her 100th birthday with a sky-high helicopter ride over Cleveland. Thanks to her two daughters, Rosie and an entourage of friends and relatives headed to Burke Lakefront airport Aug.16 for a wish come true.